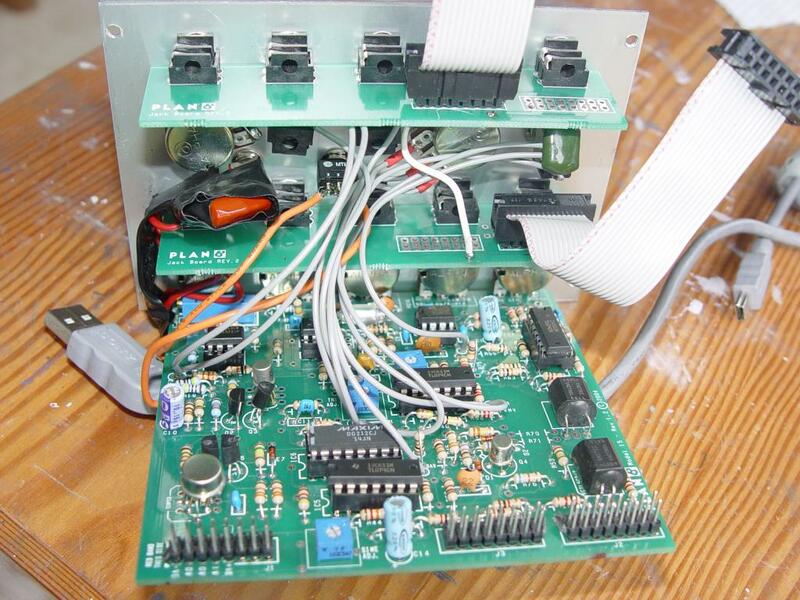 This page contains some simple modifications (swapping out components etc.) 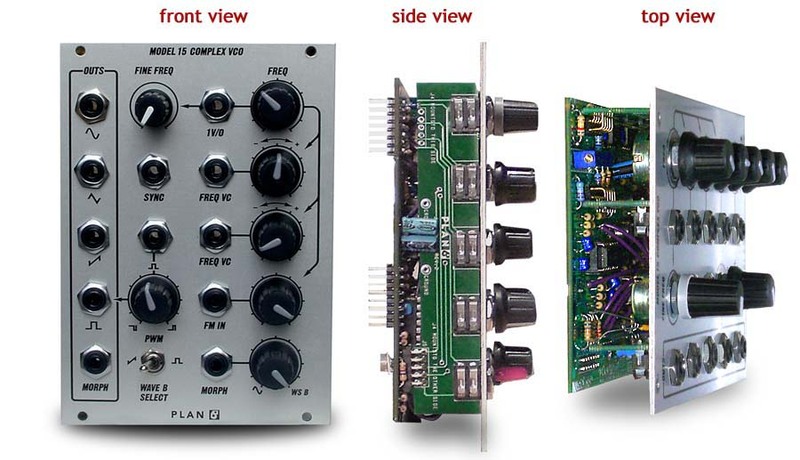 to the M15 VCO, mainly to bring earlier Rev 1 versions into line with later revisions of the module. The M15 has been through four major physical (form factor) revisions; there were several electrical revisions, as circuitry was added or modified to improve or enhance performance; and there are numerous component fitment differences (basically different resistor values), again to achieve changes in performance. 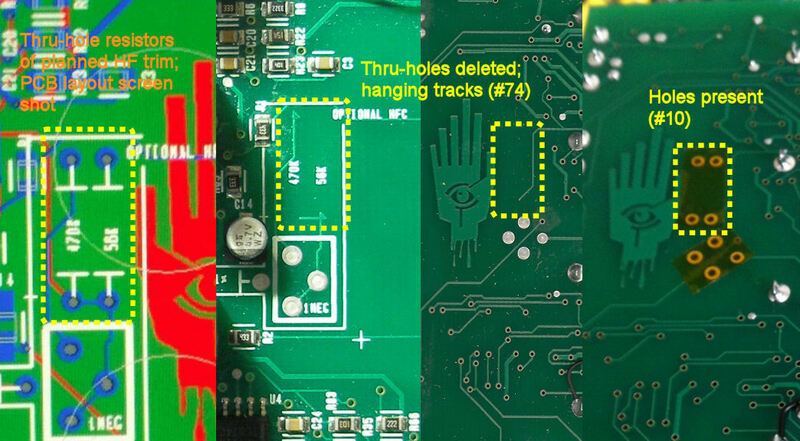 Unfortunately configuration control was clearly never one of Plan B's strong suits, as several of their modules exhibit PCBs which are functionally different in some way, but which bear the same revision level in the silkscreen printing on the PCB—the M15 is victim to this too. In some circumstances this can (understandably) make conversations or exchanges about the M15 difficult: the table attempts to summarize the functional differences between the different revision levels; the different physical configurations are thankfully easy to distinguish, and are described after the table. 1.2 Expo converter now integral to the main board4; analogue switch chip is a smaller device (DG212, 16 pin)4,10; the DC offset trimmable from the tri wave (via 'Tri Adj' pot)1; tempco resistor is still through-hole5; PCB is now double-sided. ...and this as 'rev 2.5/2.5', so the two 2.5s can be easily distinguished from each other! The red broken line shows the extent that the PWM is effective over—outside of this region the square wave is 'extinguished' because it goes to one rail or the other, and so is inaudible—and we see that this occupies only about the middle third of the pot travel. 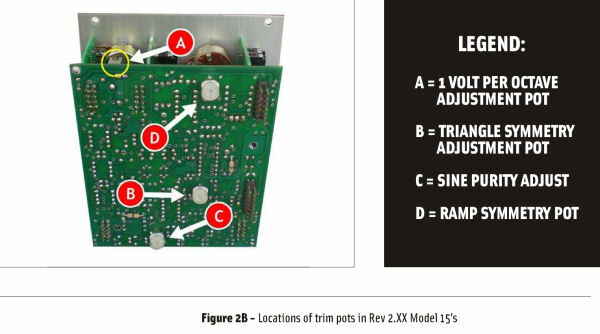 Simply replacing the pot with a standard 'B' linear taper-type shows that more pot travel is required to change the voltage, and hence the PWM is effective over a larger amount of pot travel, the green broken line, with perhaps more like two-thirds of the pot travel being usable now. Overall morph amplitude: the change '0Ω link: overall ampl' is to replace the 100kΩ resistor with a short (this brings it in line with at least revs 2.4 and 2.5, and perhaps earlier). 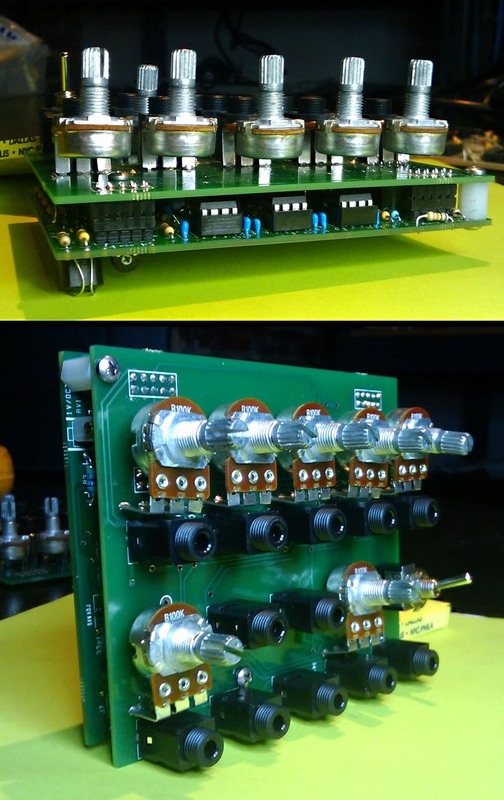 The 100kΩ, with the 82kΩ below it, gives a gain of just under two for the morph circuit, which makes the sine in particular have a rather large swing—with the short, the buffer is simply a unity gain one, making the sine about ±5V, the saw ±3.5V, and with the 'square wave amplitude' mod below, the square about ±3V. I have since received reliable information that indicates that this error occurs on all rev 1 levels—on later rev 1s, the capacitor is in the same place, but is designated as C14. I'm really only providing this for completeness, as I haven't examined the action of lowering the resistor concerned, R28, in any great detail. However looking at the circuit, R28 determines the upper switching point of the comparator at the core of the oscillator, and lowering it will increase the amplitude of the triangle wave developed in the core—the sinewave is derived directly from this signal, and so it is quite likely that changing R28 will require some tweaking of the sinewave trimpots in order to reset that for minimal distortion. The sync input feeds directly through R28 to the comparator, and thus that input has a direct effect on the points where the oscillator switches, hence the syncing effect, and (very likely) why changing its value may have a sonically different/interesting effect (but as I say, I've not looked at the detail, nor even scoped it...). Just to show that I listen to ou guys, if you want to make your Model 15 sync from what it is stock to a very hard, change R28 (a 56K horizontally-positioned resistor right below the SYNC wire on the PCB to 10K. Another option is just floating a 12k over the 56K without removing it - so you solder the leads of the 12 to the leads of the 56K. Just make sure those leads don't touch anything else if you go that route. I will shipping all new VCOs with this mod in. - my rev 2.5/2.5 has a 12kΩ (and heard of other 2.5s at this value, so I assume they were 2.5/2.5s too). We've added an output buffer to the PWM circuit (which was handled another way in the older versions) and a bypass cap or two. Nothing serious. The new (flat) VCO also has a pathway for the (I promise) soon to be released 15A expander. It's another connector. Look on this blog for what the 15A does. Btw - I've found the missing link which was making the +/- octave switch behave so poorly...so this should be coming out with the rest of the ELF's. Most the bigger changes had already happened by the time we flattened the unit out, namely: the AC offset triangle output (the first release was offset all above ground), the harmonically improved sine wave, the use of an SMT tempco resistor, the substitution of our analog switch - initially used only because I really thought I'd only be making 25 of these for that semi-custom , very limited order on the Doepfer list and I happened to have 150 of these really expensive 18 pin SPDT analog switches. So once those ran out, I replaced it with a more affordable SPST switch which was better suited for the application. The additional trimmer now found on the current rev VCOs was added stop us from having to hand-select the fixed resistor which would yield the best overall sine shape. 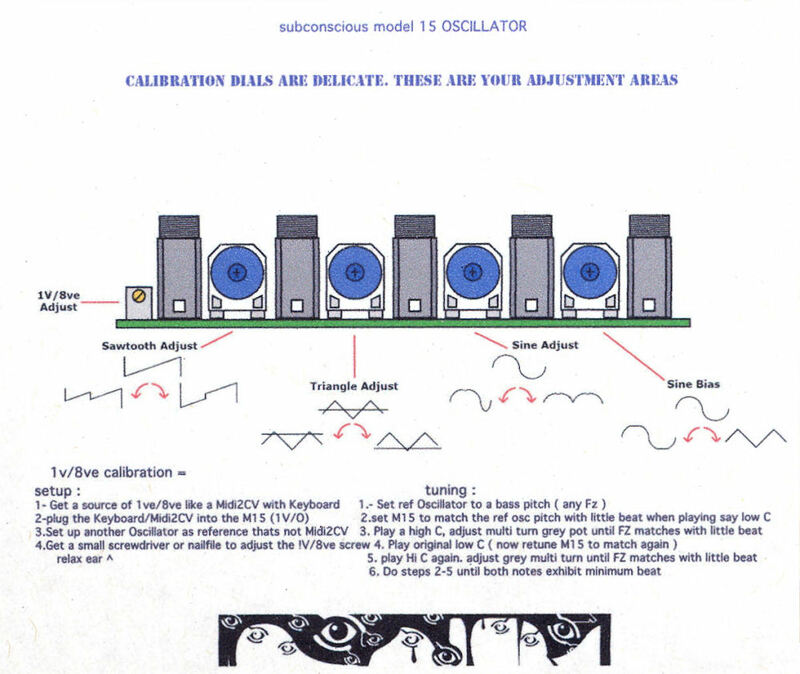 When the Model 15 first came out we used an over-speced (read: unnecessarily expensive) FET in the sine shaper. We found that a less expensive part offered no sonic degradation once set up correctly, but required a bit more tuning as the lesser expensive model had a wider gain range. So we added a resistor which set the amplitude where it need be. The net effect instead of a $3 part we could use a $.20 part with the same exact results. Further, we also added a new function which reduced the amount of total harmonic distortion, so make that a $2.80 cent gain with superior results. This did require I hand tune each sine shaper by selecting the proper fixed resistor value to compensate for the new FET's part to part gain variance (FETs in general are very loosy-goosy). About 100 VCOs after I became completely sick of doing this I then added a trim pot to adjust this easier. Even though we lost $.60 of our initial $2.80 gain, it was money well spent as I was REALLY tired of going through this exercise. That's probably more info than you wanted, but that's the full story. 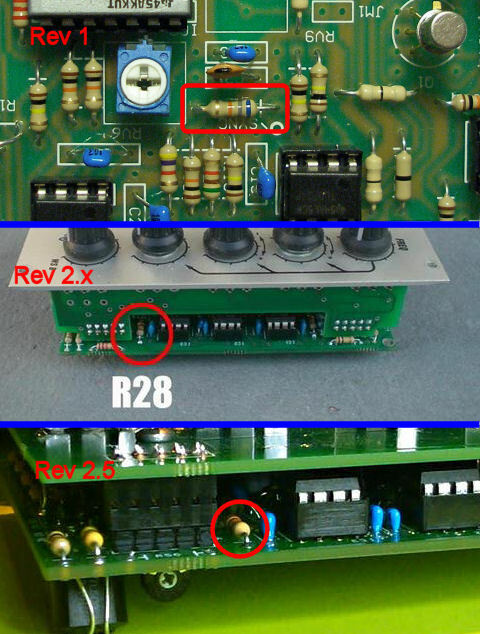 Having seen photos of a Rev 2.0, it appears all four boards in the assembly underwent changes to become 'rev 2.1': clearly the sine ampl pot was added, and the three parallel boards also have much higher 'arches' away from the main PCB at the 2.1 versions, presumably to increase clearances from components on the main PCB (and I'm assuming here that the three smaller boards would have changed 2.0→2.1 at the same time as the main board did—compared to my rev 2.4, there are other tracking differences in the main PCB from the 2.0, but these could be other changes made at 2.2-2.4!). Please note: This won't work with M15's that are 1.1 or below. There may be another procedure for that, but this is a bit more complicated. Also note that you do not need to do this on rev. 1.5 and above - it's already in there. Unfortunately, as of mid-2013 the ear-group.net website seems to no longer exist, the link above with it: the Wayback Machine has captured that page, but again unfortunately the many photographs it references aren't there: http://web.archive.org/web/20120801094731/http://www.ear-group.net/sinemod.html. Sinewave circuit evolution: the original/Rev 1.1 circuit is essentially the same as the Rev 1.2-1.4, albeit with some component value differences; the change at Rev 1.5 brings it almost in line with the later Rev 2.x version (it wasn't complete until the addition of the 'Sine Ampl' trimpot mentioned above); on examining a Rev 1.2 close up, the instructions referenced above for retrofitting the changes to Rev 1.2-1.4 boards do make sense (without the photos); whilst the component locations concerned didn't change much between Rev 1.1 and Rev 1.2, there are several 0Ω links replaced with PCB traces in going from single-sided to a double-sided PCB (making things harder to tally-up), but the main thing stopping the mod being retrofitable to the Rev 1.1 is the absence of the ability to trim out the DC from the triangle wave, an enhancement that appeared in Rev 1.2 (it would not be beyond the realms of plausibility to add the necessary trimpot, but it would require some precision track-cutting to achieve it). The circuit, the module functionality and the price remains unchanged. These improvements were put in play to increase our production throughput, decrease the potential for field failures with the elimination of the 12 hand-soldered wires and addresses the continual Cliff jack availability issue which has shut our production line down in the past, most notably last summer at the worst possible time imaginable: two weeks before the ELFs were to be released when Cliff announced they were halting worldwide production for three months. Freed from those constraints I am confident the M15 availability will flourish. Note 4. Photo showing expo conv now on main board (bottom left corner), and smaller analogue switch IC (second IC up), from thread How can I fix a blown Plan B Model 15 rev 1.2 ? at MuffWiggler. See also Note 10. Note 5. Photo (in same thread), showing that the tempco is a through-hole device, tucked-up underneath the matched pair (6-legged can bottom right). Note 7. In comparing the circuits, I noted 22 component differences (and this doesn't include that all pots are changed): the majority of these (16) occur in the acknowledged changes to the PWM & morph circuits, and the sine shaper (the Vactrol type in the morph circuit is changed from VTL5C2 to VTL5C3 too). Of the half-a-dozen (apparently unacknowledged) changes in the CV processing/oscillator core, two at least have the potential to impact the basic operation of the VCO (e.g. 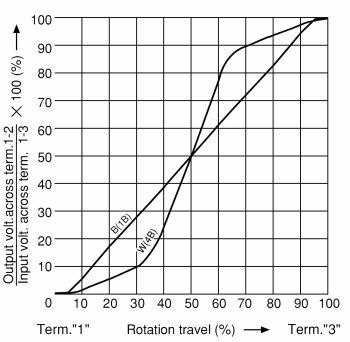 the tracking): there are reports of people finding it difficult to calibrate their units, but accurately quantifying the impact of the changes is unlikely to be straightforward. 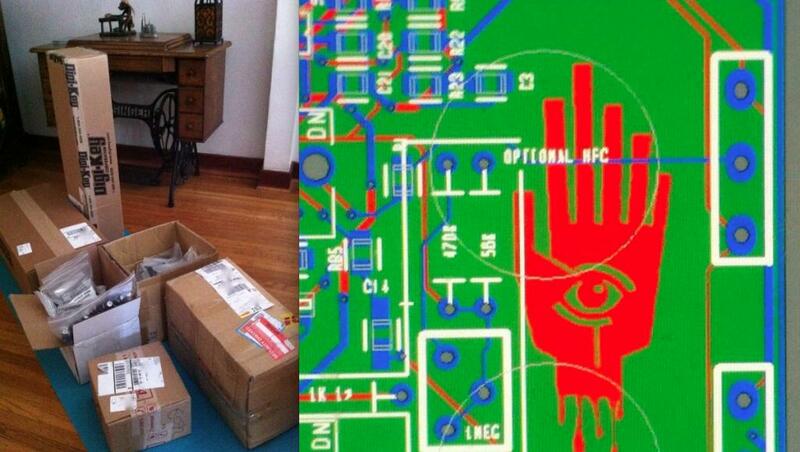 It is possible that there are two different PCBs with the 'Rev 4.0' designation on them. 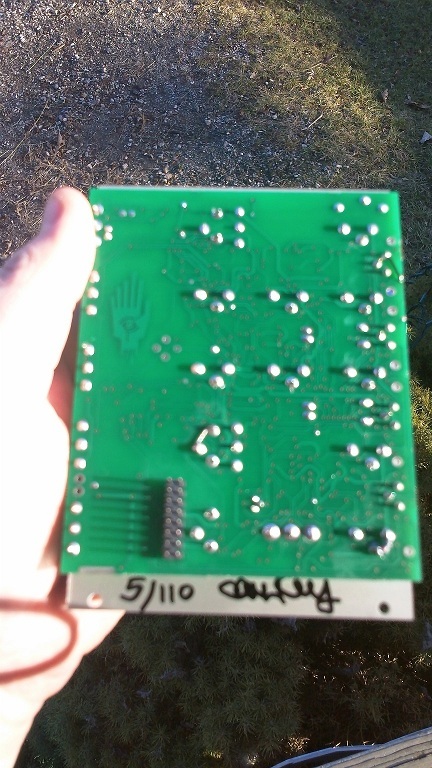 My unit (#74/110, and marked Rev 4.0) has clear vestiges of an attempt to incorporate a 'high frequency trim' circuit: thru-hole footprints for a resistor and trimpot, and silkscreen designations for two other resistors, but with their footprints deleted and some tracks left dangling in 'mid air'. 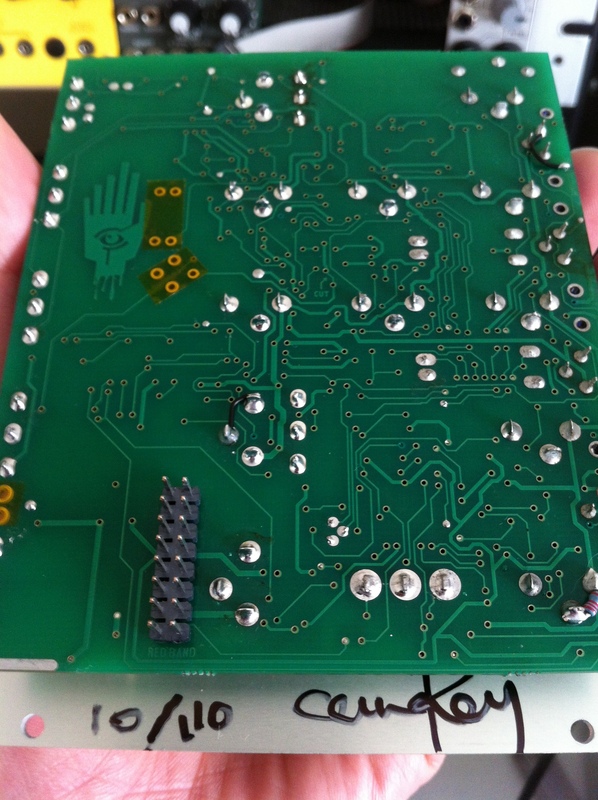 This post includes some detail of a 'progress update' from Subcon, including this screenshot of the PCB layout, clearly showing these same 'Optional HFC' components, and a comment alluding to it: "I've been told of other secrets on the board for super users, but that is a secret. isn;t it?" [sic]. This photo (which was linked from this post, but has gone now), shows that the holes are present in unit #10; here is a composite photo showing the layout, top and bottom of my unit, and unit #10, showing 'initial intent', 'not present', and 'present'. Finally this photo from this post shows that the holes are again not present in unit #5—so clearly two different PCBs exist, but no clear indication of which came first (two early units exhibiting both PCBs), and an apparent later unit, #74, with an early designation, '4.0'. Note 9. On the Rev 1.3 the tempco changed from a through-hole to a surface mount device, but curiously it is on the solder-side of the board, along with the LS318 matched pair, which fits snuggly over the tempco. The import of this was initally lost on me until I had occasion to compare the 1.3 layout with a photo I had taken of the 1.2 board, and immediately realised that on the 1.3, the two layers on the board are reversed, i.e. what is the bottom layer on the 1.2 is the top layer on the 1.3 (and vice versa for the other layer). It is possible this was merely a batch problem (in my job I have seen four-layer boards where the PCB fab house have unintentionally switched the inner two layers—the boards worked fine of course, but looked quite odd in a side-by-side comparison with a 'good' board!). 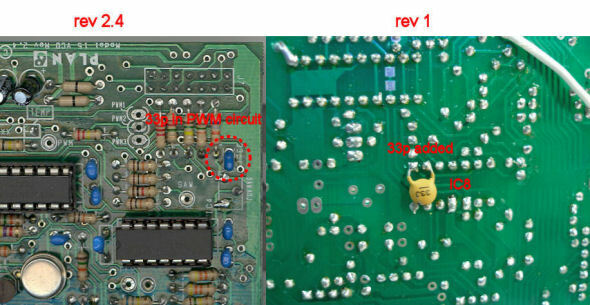 This is illustrated in this photo, which is a mirrored image of the bottom of a rev 1.2, and so it looks as it would if you could see through the PCB to it from the component side, next to a silhouetted image of the top of the rev 1.3, from which it is evident that the trace pattern is very similar (the latter looks a little weird, as I've done a 'perspective straighten' on it to account for the angle it was taken at). 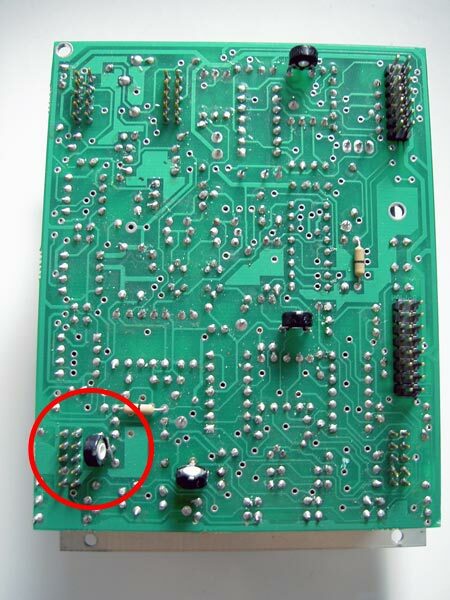 Could it thus be that the rev 1.3 to 1.4 change (wholly or partly) consisted of rectifying this switch in layers (so the LS318 plus tempco would have been back on the solder side, and thus wouldn't have presented anything of an exception as they appeared to on the rev 1.3)? Note 10. The larger MAX333 analogue switch chip used in the original batch of Rev 1 M15s was apparently replaced specifically by the Maxim DG212 in the Rev 1.2 design. The Maxim version of this chip does not require a 'VL logic supply' voltage at pin 12, so the rev 1.2 design leaves the pin unconnected (it is IC6). 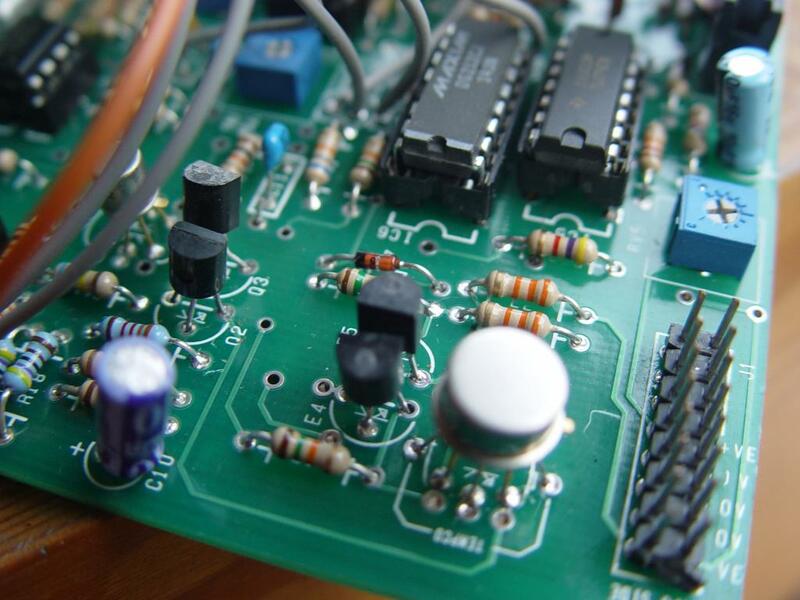 This meant the use of other makes of chip, such as Analog Devices and Vishay Siliconix, was unnecessarily excluded, as without a suitable voltage at pin 12, the tri-to-saw conversion (the chip's function) will not work, and a tri wave will be output instead of a saw. I don't know at what point this was recognised, but my Rev 1.3 has what looks suspiciously like a factory-fitted mod, in the form of two resistors soldered under IC6, to rectify this situation. By the time of Rev 1.5, these two resistors were properly incorporated into the PCB design—it is very possible that this actually happened at Rev 1.4.